The SHIFTmu: Powerful and modular. Preorder this pioneering piece of technolgy as a single smartphone and later expand it with additional accessories (such as hub, keyboard, tablet monitor, etc.) to an all-in-one device. You can also pre-order the SHIFTmu as a bundle. So with everything that goes with it. Here you can pre-order the complete set. 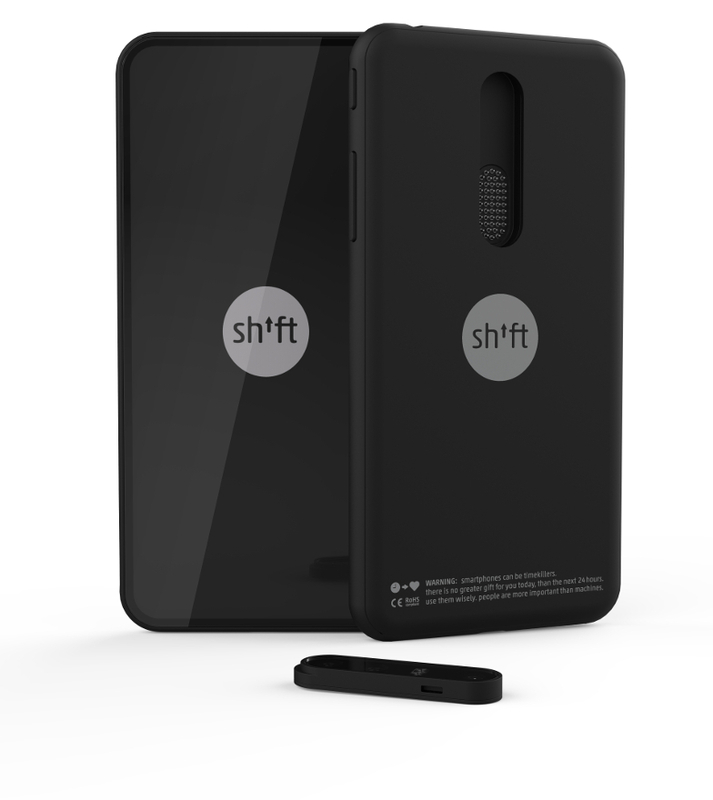 Consisting of: SHIFTmu (smartphone), mobile tablet screen, mobile keyboard, hub and power supply. Our universal smartphone, equipped with efficient and powerful modules, easily takes on tasks of a fully functional computer. According to our company philosophy, we combine sustainability and modularity with minimalistic and beautiful design. Soon you will only need one powerful device, that can do it all. This is the first universal all-in-one device in the history of computers! More than 70% less resources are used in the production of a SHIFTmu compared to ordinary PCs or smartphones. Complete functionality of a fully equipped PC! High-performance and powerful modules, built in a minimalist concept and beautiful design! Can be pre-ordered as separate smartphone or as part of a set. Including smartphone, hub, mobile tablet screen, mobile keyboard, and power supply unit! Available as set, including smartphone, hub, mobile tablet screen, mobile keyboard, power supply unit. Das SHIFTmu wird es nicht in 2018 geben. Es bleibt auch fraglich, ob wir eine Veröffentlichung in 2019 schaffen können. Wir glauben daran, dass dieses Projekt viel bewegen wird und hoffen auf eine Fertigstellung in 2020. Innovativer Fortschritt, Langlebigkeit, Elektroschrott- und Müllreduzierung, faire Herstellung… All diese Themen, die uns so sehr am Herzen liegen, werden durch das SHIFTmu einmal mehr abgedeckt und umgesetzt. Allerdings setzen sie auch einen umfassenden Entwicklungszeitraum voraus, sowie einige entscheidene Weiterentwicklungen innerhalb der Technologiebranche. Daher ist es leider ausgeschlossen schon jetzt einen genauen Veröffentlichungstermin zu nennen. Wenn du mitgehen möchtest, dann tue es einfach weil du die Entwicklung eines innovativen und nie dagewesenen Produkts unterstützen möchtest und nicht, weil du das Gerät bis spätestens Ende 2019 benötigst. To embark towards new horizons means a lot of development efforts. In many regards we cannot build on existing technology. Being a small-scale company, not all new developments are done by us, but also by our partners and suppliers. There’s a network of suppliers we enjoy working with, due to good relations and mutual trust that grew over the years. We can build on the experience of our partners, because they know the importance SHIFT has for us. In smartphone production, sustainability, repairability and fairness are generally no prime concerns. However, for us they are paramount.